Finally watched last weeks episode, was OK. The monster had potential but was massively wasted and the plot was similar to the previous episode, right down to Bill falling down a hole. Despite the fricking massive spoilers about the returns I thought it was still a damn good episode. I'm imagining massive bait and switch and that Cyberman is not Bill. For me it was pretty much as per usual these days a dissaponting season finale. Big build up with the Cybermen and the Master/Missy in the first part and then just fizzles out in the second. The regeneration starting to drag, we know he is leaving so no need. As much as I don't want Capaldi to leave I think he should have gone in this episode rather than drag it out in to the Christmas special. This two-part season finale was pretty much just a mixture of the finales from the last two seasons. Yeah, that was a bit of a 'convenient' ending for Bill. Not dead, but not in the show anymore. On the plus side though it does probably kybosh any lingering potential 'adventures of Clara and Arya Stark in spaaaaccceeee' spin off worries though. On the plus side though, John Simm was excellent as The Master, just a nasty manipulative git, who not only refuses to change, but refuse to accept that he would ever want to change to the point of murdering (possibly, this is Doctor Who) his future self. Nicely done. Clara is back at Christmas.. I'm sorry, I'm so sorry. If it were to be true I don't mind Clara but do not see any reason for her to return. They didn't specifically state that Missy was the direct regeneration from Simm so it does leave the door open for a new Master to appear that can be set between them. Bill now pretty much just like Clara, dead but not dead zooming round the universe. I thought John Simm was a hell of a lot better than when written under Davis. None of this manic flying around shooting electricity crap. 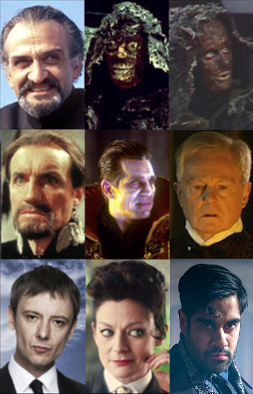 A shame really as meant I never really warmed to him as the Master. There'll be a special this Sunday after the Tennis Men's Final announcing the next Doctor. I was really hoping that we were going to find out when Capaldi regenerates in the Christmas special. Would have been a really nice surprise such as when Jenna Coleman appeared in Asylum of the Daleks.